Sorority life is one of the most fun and rewarding experiences for college women. Serving on your chapter’s executive board or serving as a cabinet director is equally rewarding, teaching young women important leadership and time management skills. Sometimes, sorority women will see leadership roles as a blessing or a curse, especially when you’re elected as your chapter’s standards chair. Contrary to popular belief, being your chapter’s standards chair doesn’t mean you have to play mom or give up your social life. Imagine an entire year of not joining your sisters each weekend, especially after midterms or finals. Even though you’ve been chosen to serve as the disciplinarian, you’re still a collegiate member. College students don’t join Greek life in hopes of being elected as standards chair, so don’t overstress about being in this role. Being standards chair ultimately means upholding the integrity and reputation of your chapter. Don’t let anyone ruin your chapter’s reputation, but don’t forget that you are a sister before anything else. If you’re attending an event and see a sister doing something they shouldn’t, approach them there. This is something every sister should do. Instead of waiting for something to happen that’s standards worthy, you can talk to them one-on-one in a way that shows you’re concerned and trying to help. Taking the role of standards, aim to be the voice of reason among your executive board and sisters as well. The standards chair should never take one side or the other, especially between sisters. Finding middle ground is the epitome of being fair, which is the highest expectation of every standards chair. Within the executive board, the standards chair should continue to be fair, but also be an expert at playing devil’s advocate. Staying positive is a must, but pointing out the things that could happen is also necessary. In sorority life, staying on edge about what your chapter’s reputation is--and what your national organization would think--is imperative. You never want to be the chapter that gets a lecture from your next national consultant visit, or the chapter that has a negative story mentioned at your upcoming convention. National consultants can also give valuable advice on how to handle this new role, so don’t be afraid to reach out to them. Remember that they aren’t much older than you and they’ve either been in your shoes before, or they are working with other chapters going through similar situations. For more resources on finding advice for your executive position, check out Where to Find Chapter Officer Help. You always want to be a trusted sister in this role. Instill equal amounts of fear, respect, and sisterhood with the chapter. Never make your sisters feel like they can’t enjoy their college or sorority experience. The two most dreaded responsibilities of being standards chair are that you have to dish out punishments to your own sisters and that you can’t enjoy your free time without sisters thinking you’re going to catch them doing something against the chapter’s rules and bylaws. By showing your chapter that you can have fun, they’ll feel more relaxed around you. After all, you were a sister before you were elected into this position! Get organized and don’t forget to designate some “me time.” Avoid getting burnt out by doing at least one thing per week that makes you happy. It’s easier said than done, so take these quick tips on how to avoid the officer burnout. Organize your time by deciding how many hours per day you should spend on schoolwork, your job, your position, and any extracurricular activities you’re involved in. Setting Sundays, Tuesdays and Thursdays as “Standards Days” will leave you feeling much better. If you focus a portion of every day on your position, not only will you begin to burn out, but you’ll also start to mentally check out. Some things are time sensitive when it comes to this position, but be careful about making every little thing a fire that needs to be put out. With an entire chapter of sisters, this is where everyone helps their standards chair. Big sisters and roommates can help steer others in the right direction, so you don’t have to play hall monitor 24/7. Every member’s reputation is tied to the letters they wear on their shirts, which means every sister should want to protect and withhold that reputation. Follow up on the girls who are sent to you. Genuinely caring about them and checking in after a standards meeting can go a long way. Ask them to grab coffee with you off campus, go for a walk together, or ask them to join you in crafting for your future little or grand-little. Use that time to see how they are doing and if they’re struggling with anything else. 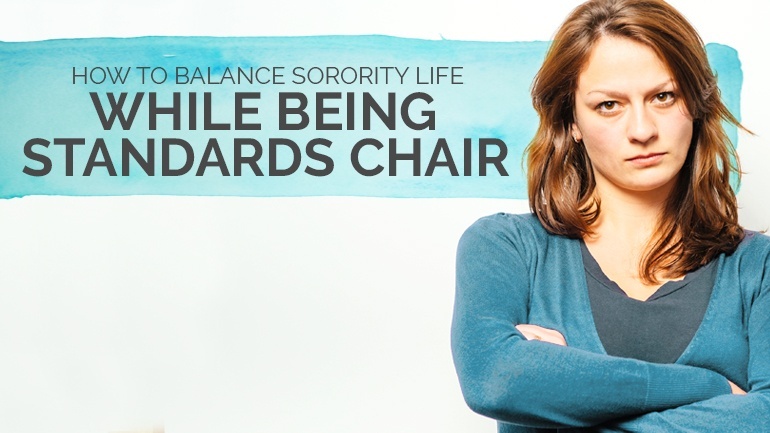 Not only will they feel like you’re taking time out of your day to invest in them, but they’ll also understand that your job as standards chair isn’t to just punish your sisters. Bonus: Those sisters won’t have negative things to say about you or your position later on down the road. Be sure to keep confidential things confidential. Your sisters will respect you more in the end if you keep standards issues and executive board items to yourself. The girls that attend standards meetings will also feel more comfortable around you after their meeting. Remember that you are aiming to be the trusted sister, not the chapter gossiper. Your goal is to help your sisters, not embarrass them or tarnish their character. Plan an event to get morale up. This shows sisters that you care about them and you can still have fun. Remember Standards Days? Use those for positive reinforcement in terms of chapter morale. Send a quick message in your chapter group chat to recognize them for having a good week, or that there is an event in the works for them. If you want to plan an event, it can be as simple as a pizza party and movie night at the chapter house. Or it could be more personal, like a positive paint party. Each sister wears a white t-shirt and dips their hands in colored paint. One sister will call out statements like “Touch a sister who makes you smile.” Also, implement snaps at chapter. When sisters help each other, or simply spend time with one another, let them give each other praises at the beginning of chapter meetings. The standards chair or president can lead snaps by calling on sisters that have a positive moment to share. Snaps are a great way for sisters to recognize each other and get the meeting off to a fun and light-hearted start. Above all, take care of you first. Getting lost in the standards world will leave you feeling drained, sometimes even resenting your sisters and organization. Don’t get burnt out from being standards chair. If you aren’t putting your personal happiness and fulfillment before your executive board position, sorority life will not have the desired impact it is meant to. No matter what position you take on within your chapter, this is incredibly important. New officers, or even officers who need a change in managing their current position, should read over So You’re a New Fraternity Officer: 5 Lessons to Keep You Sane. No one gets everything right being an officer, especially standards chair. Remember that you are meant to learn along the way-that’s what sorority life is all about!